Home » Vegan pie everywhere! Say you want to celebrate so vegan pie is asked for! But where do you go? While there used to be only a handful of places (restaurants) which would offer it, these days it seems like no new cool coffeeplace can do without offering some vegan sweet stuff. Great! This is a list of all places which are currently offering vegan pie. And we’re talking ’bout the real stuff, no ‘raw energy balls’ or granola bars, please! Vegan lunchroom/bakery specialised in cakes! They also do a vegan high tea. One of our most favourite places in town, right next to Westerpark. Vegan lunchroom and more (also breakfast and a few nights a week dinner) with a great menu and various homemade vegan cakes, donuts etc. At Spaarndammerbuurt. Vegetarian buffet restaurant with plenty of quality homemade vegan pies to choose from, both in the buffet as well as in the pie fridge near the counter. At Czaar Peterstraat. Vegan grocery shop and lunchroom in the centre. Sells homemade pies, brownie bij Lariekoek as well as donuts and cakes made by the magnificent Nono Cakes. Always a different selection of mostly vegan pies at this cozy vegetarian restaurant, beautifully located at the Prinsengracht. One of the oldest vegetarian places in Amsterdam. Bagel cafe with more than 20 locations in town. They have a vegan pecan pie on the menu. City-wide coffee chain. They serve vegan cheesecake from Daiya at locations Javaplein, Middenweg, Rijnstraat and Wibautstraat, raw cakes by SUE at some other locations. 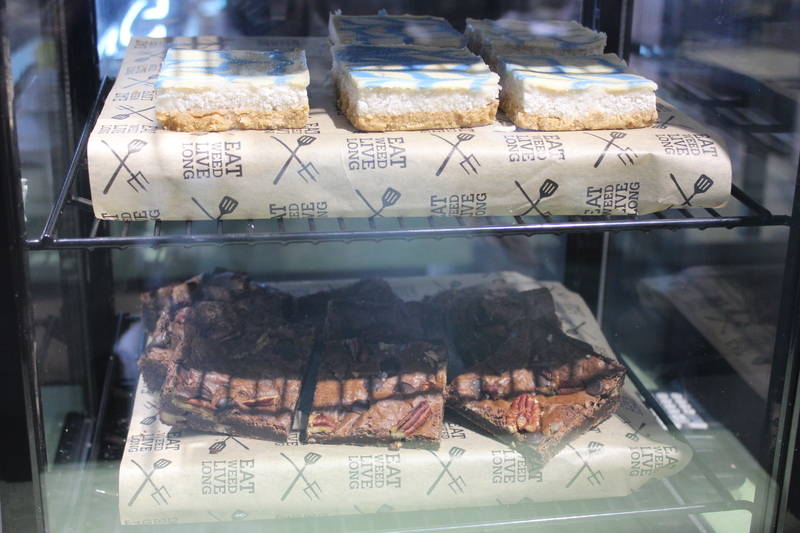 At various Ekoplaza organic stores, raw cake by Lady Fruitcake! Vegan-friendly lunchroom Lavinia has a vegan chocolate brownie on the menu as well as various raw cakes by SUE’s. Locations at Kerkstraat / Amstelveenseweg. Both locations (Bilderdijkstraat / De Pijp) of Mastino have raw cakes by Sharp Sharp, Mastino V also stuff by Nono Cakes. Salad restaurant with several vegan cake options. Seven locations in town. Juice bar with multiple locations, has raw cakes by SUE. Music store at Utrechtsestraat with small cafe inside. Serves a vegan brownie. Yoga/meditation centre at Lauriergracht, the café has vegan raw pie on the menu. During the day Esprit Cafe, at night it’s called Jackson Dubois. Special vegan section on the menu, including a raw cheesecake. Located at Spui. Climbing gym near Central Station, cafe serves vegan cake by Plants Gone Wild. Very vegan-friendly restaurant/cultural institute near Central Station. Has a vegan cake on the menu. Lifestyle store with lunchroom at Negen Straatjes. Raw chocolate avocado cake and vegan blondie on the menu. Small vegan place close to Nieuwezijds Voorburgwal, offering some vegan cakes. Cupcake store at Rozengracht, has three vegan ones on the menu. Sustainable hotspot at Amsterdam Noord. They have vegan raw cakes from SharpSharp. Raw food restaurant at Overtoom with a raw pie option. Bakery at De Baarsjes with vegan (and glutenfree as well) cupcake and pie options. Bakery cafe with three locations in town. The one at Westergasterrein has a vegan apple-abricot-pear tart on the menu. Coffee place at Spaarndammerstraat, stuff by Nono Cakes. Coffee place / gallery at Jan van Galenstraat, also cakes by Nono Cakes! Vegan fastfood place close to Kinkerstraat. Has several sweet options including ‘tompouce’, donuts and a fudge brownie which is to die for! Organic orchard with farm shop and small cafe. Always a vegan pie on the menu. On the western edge of the city. No nonsense vegan place in Bos en Lommer with always vegan pie on the menu. At vegan restaurant Meatless District (Bilderdijkstraat) they offer vegan pies from Dophert! Multicultural creative hangout/restaurant at Bos en Lommer. Vegetarian/vegan food, vegan brownie on their menu. Betty makes vegan raw cakes and other stuff. Usually on Saturdays at Mercator market or Ten Kate market, check her Facebook for more info! No refined sugars are being used in the kitchen of this lunchroom. Also vegan options including pie. At Bilderdijkstraat. Loose leaf tea, coffee and raw cakes by SharpSharp at this tearoom at Jan Evertsenstraat. Store/lunchroom for kids and their parents, at Bilderdijkstraat. Raw cake by SUE on the menu. Vegetarian lunchroom close to Wibautstraat with vegan carrot cake, brownie and even more vegan options if you want to order pie. Lunchroom at Transvaalbuurt, famous for its club sandwiches. Also vegan options, including cake by Nono Cakes. Glutenfree store/lunchroom at Indische buurt, offers raw cakes by Holynut. Bakery at Javastraat which always has a (glutenfree) vegan option, more vegan stuff available on order. Vegan and glutenfree bakery located at Zeeburg, also Wednesday – Friday at ZuiderMRKT. Vegan restaurant close to shopping centre Oostpoort, offering apple pie, brownie and an always changing raw pie. Coffee place next to Vondelpark, has cakes and donuts from Nono Cakes. Great independent organic store at De Pijp, offers raw cakes by Holynut. Bar/ bistro at Gerard Douplein, cakes by Nono Cakes. Small vegan place at De Pijp, offering donuts and pie made by Nono Cakes. Organic store at Amsterdam Zuid, offers raw cakes by Holynut. 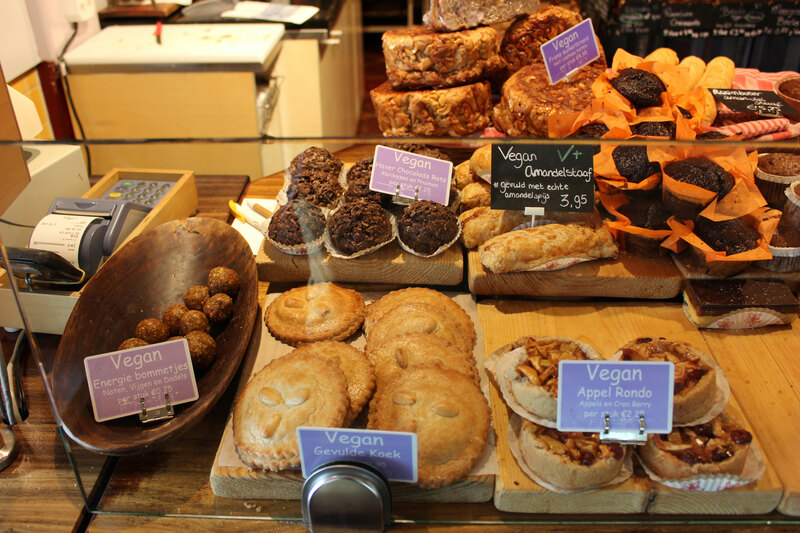 Vegan-friendly restaurant at Ferdinand Bolstraat with vegan tarts and cakes. Vegetarian Middle-Eastern restaurant with hummus and more, Stadionbuurt. Always a vegan cake. Raw food café close to Museumplein with some raw vegan pie and cake on the menu. Bakery with LOTS of vegan cookies, pastries, pies, bread. Not located in Amsterdam itself but just a 20 minute trainride away, north of town. 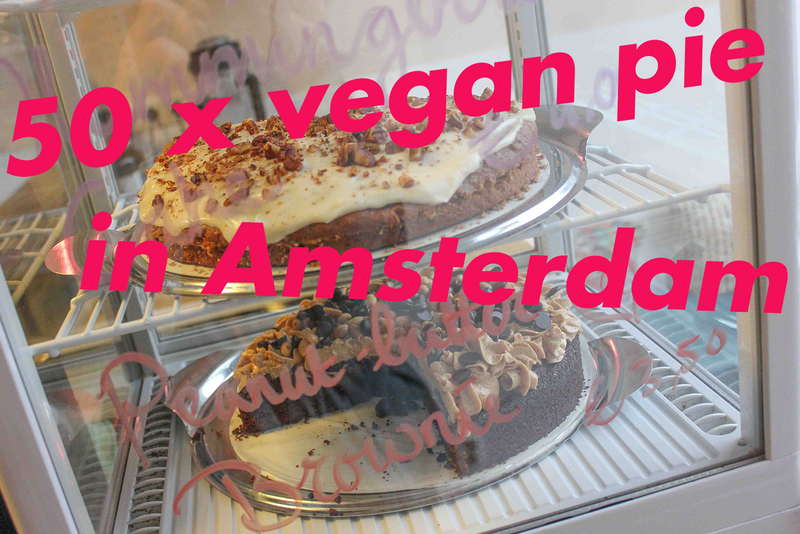 “Where can I get vegan spacecake?” One of the most asked questions by vegan visitors of Amsterdam. Vegan High makes space brownies and other stuff, available on order only. Specialised vegan chocolate store at De Pijp. Doesn’t necessarily has vegan cake but lots of homemade chocolate based sweet stuff! Mostly vegan bakery with many many options! Raw vegan cakes and other treats. Vegan bakery with various options, available on order. General vegan catering including pies, cupcakes etc. Home bakery at De Pijp with vegan options on order: cake, chocolate truffles, cupcakes and cinnamon rolls. Beautiful cakes and others sweets at this vegan business. Also gluten- and sugarfree options. Vegan cakes and other treats. Vegan raw food catering, including patisserie. Baker Willemijn is vegan herself, almost all of her cakes and sweets (which is a lot!) can be ordered vegan. Do you know a place which offers vegan pie but is not mentioned? Please let us know in the comments! National ad campaign #kiesvegannu !